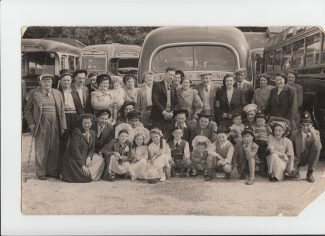 This photo shows a day out from Tilbury…………can you tell me who is in the photo or where it was taken and where they were going? Annie here is the list of names ,from left to right back row, first person not sure of name but beleive it was aunt lils father, next to him Bill Jenkins uncle, Tom Sargeant uncle, Ralph Richardson uncle, Rhoda Richardson aunt, holding Kathleen Sargeant sister,Edna Sargeant aunt, Brenda Richardson cousin, Alf Sargeant uncle, Florence Jenkins aunt, Florence Sargeant Grandmother,Alf Sargeant Grandad, Elizabeth Richardson aunt, Fed Richardson uncle, Gwen Sargeant aunt, Lilly Sargeant aunt, Lot Sargeant aunt, Doreen Sargeant aunt, don’t know name next to her, Sam Sargeant uncle, behind him Philip Richardson cousin, Edward Sargeant (snr) Father,Margaret Sargeant Mother, David Sargeant cousin, Bill Sargeant uncle, Edward Sargeant (jnr ) Me with police hat on striped jumper looking none to pleased, Front rowleft to right, Rita Sargeant cousin, Janoce Sargeant cousin,Joyce Sargeant cousin, Roy Sargeant cousin, Linda Jenkins cousin, Bill Jenkins cousin, Colin Richardson cousin, Maureen Richardson cousin, Jeffrey Richardson. Thats the lot . Anything more i can help you with please contact me i will be only to pleased to do so. Thanks Ted for all this information about your family!! Hello Edward. Sorry for the delay in replying but have only just read your reply. Granny Farrows grave is in the new cemetary, as you go through the gate its about half way down the driveway, before you reach the chapel, on the left hand side, its close to the edge. I had a look on the internet for Pulham st mary but it kept coming up in Norfolk and not Suffolk? Do you know granny Farrows maiden name? and do you know who Alfred Frederick Sargeant was whos burried with her? I look forward to your reply and hope that some how we can meet up some time. Lesley. Hello lesley. It is in the libary at grays and people to meet in the foyer at 10.30 and there will be a short break finishing at 1pm. You have to book in with Annie or if you wish i can book you in, let me know. In regards to granny Farrows grave is it in new cemetry or at the cross keys church. Hello again Edward. On my mums side (the Day family) I have resurched back to around 1742. They came from Gloustershire. My Mum and I went up there quite alot and found relations and even went in the cottage that my Grandads mother lived in, she too was a midwife. It would be great to meet up and learn more about my Dads side of the family. i am not sure where the grays museum is located, is it at Thameside theatre? What time does the talk take place?, i can do during the day. I went to the cemetary to take another look at granny Farrows grave and the person buried in there with her is Alfred Frederick Sargeant, he was buried there after her. So Edward if you could let me know when and where. look forward to hearing from you! Lesley. How nice to receive your comments lesley about Marth farrow(my great grandmother Emma was my grandmothers sister Florence )Yes she was born in pulham-st-mary suffolk, also she did remarry a Mr Boughton who died 5 years later. I would love to meet up with you and show you the family history that i have gathered together back to 1754 my 4th great grandmother. Do you live local and would you be going to grays museum on 21st may they are doing a day on The History Of Tilbury, if so i will be there maybe we can meet up. Does anyone in Tilbury remember or know anything about my Great grandmother Martha farrow who i believe was a midwife in Tilbury many years ago . She died in 1941.One of her daughters was my Grandmother who arranged the outings mentioned above. 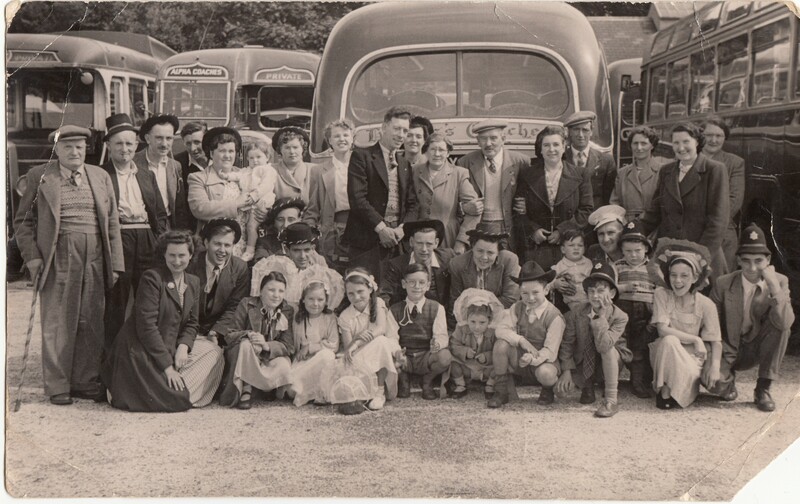 Annie the photo was taken in the coach park at Margate in Kent.Once a year nan & grandad would take all the family for a day visit including a booked lunch. I can name all but 2 people in the photo including Richardsons Jenkins Sargeants if you wish. I am third from right in front row. Thank you so much for that info. It is such a great photo. Did you tell me about this photo? I am sorry if I forgot but if you could name the people that would be fantastic. What a big family! !